This is the first punch I've cut. The model was a Tavernier's Ascendonica T that is missing in the matrices kept at the Plantin Moretus Museum (MA 77) but can be found in printing in a number of books. I've committed a number of mistakes that I will try to avoid in the next punch. 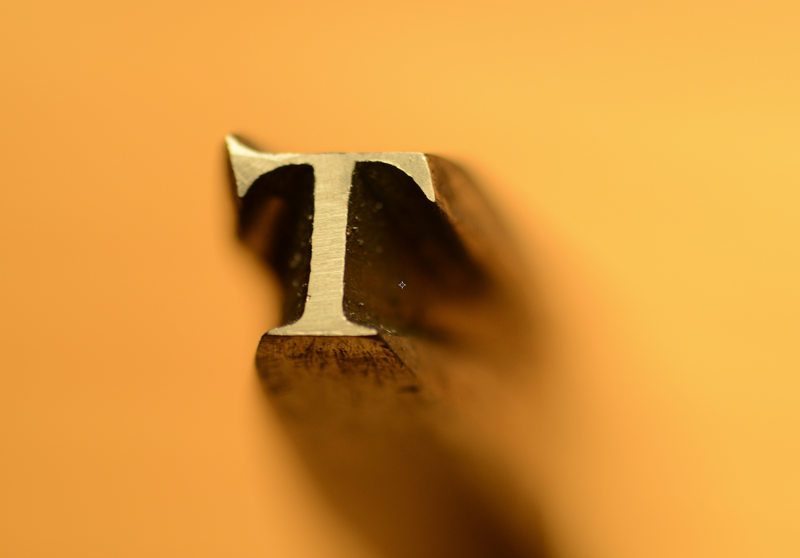 I think the most important one was to leave the counter for the end and then realise I could not find the right angle to file or cut the more delicate parts of the top left serif. This punch was all made by filling and graving. In the next one I will make a counter punch and see how it goes. I think a counterpunch will make the work on the counters much easier and making a counterpunch is not such a big deal. Having perfectly polished contours is also a challenge and I am still figuring out what technique I should use to achieve it. Thanks for posting your punch, Ramiro. And congratulations! This is probably a good discussion thread to continue in the long term, because everyone will (or has already) cut their first punch. I'll cheat a bit, though. 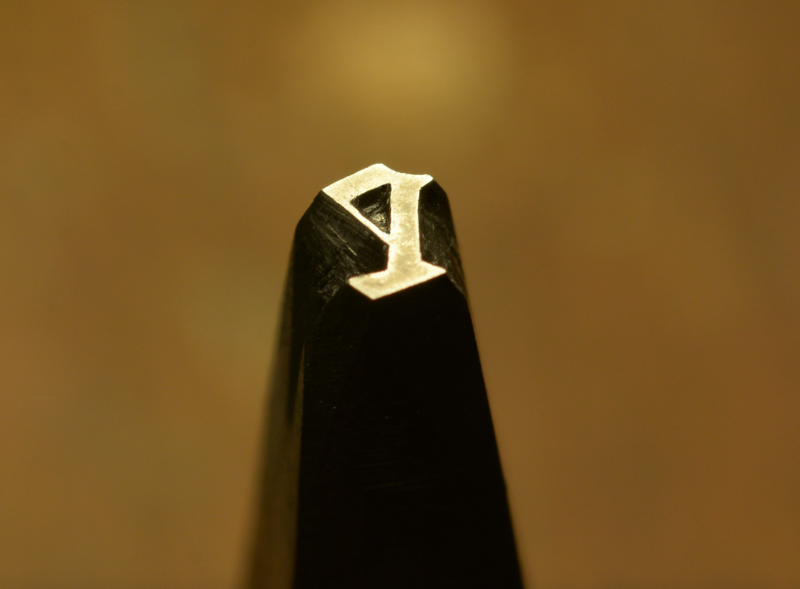 The photograph below shows my third punch - but it is my first punch which included work with gravers. (My actual first and second punches were a filed (no gravers) counterpunch and punch which were so bad I'm ignoring them.) If you look closely at my first (third) punch here, you'll see that it is terrible - but the fact that it exists at all still amazes me. This was done at Stan Nelson's 2016 class "Understanding the Typographical Punch" at the Wells [college] Book Arts Center Summer Institute. It was based on a soot transfer from a 14 point Gill Sans 'P', but by the time I was done there was no outline of that character surviving. So it's just a generic gothic 'P'. All of the outside surfaces were done entirely with files. The counter was cut out entirely with gravers. It is shown here before hardening, at which point the work had taken two (very full) days of class time. This punch cracked longitudinally during hardening and therefore could not be driven to make a matrix. Ramiro has renamed this thread to "our" punches - thanks; I was worried that I was hijacking your thread. It would be good to make this "our" very much more than just two. Including Ramiro and myself, I know of eleven people who have cut their first typographical punch within the last year or so. There may now be more new activity in hand punchcutting than there has been for many of years. Certainly there is much work to show. I look forward to seeing it and learning from it. Don't be shy. This is my first attempt to make a punch and a counterpunch. I tried to copy the letter O from the Guttenberg bible. This punch was made using some files and a sharp graver. All the work took about 4 hours and +1 for building an oven for metal hardening. Material - random steel, 12x12 mm square. The O surface is far from perfect but i made this stuff before i ordered a facer. Very nice, Nick. If I am not mistaken, you are not using a fine grain stone like slate or Arkansas to do the final polishing of the punch's face. 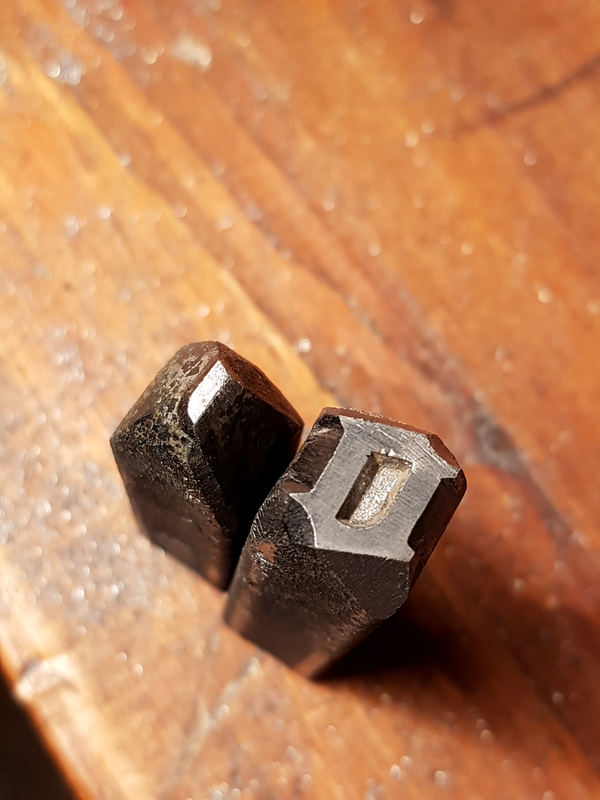 Advice: white Arkansas stones are good for the final polishing of gravers but for the punches they are quite small (and expensive). You can try to find a slab of slate of about 30 cm x 15 cm, polish the surface with another sharpening stone or a diamond plate, and you'll be fine. Question: what kind of oven are you using to harden the punch? I just use a propane torch and a couple of fire bricks. 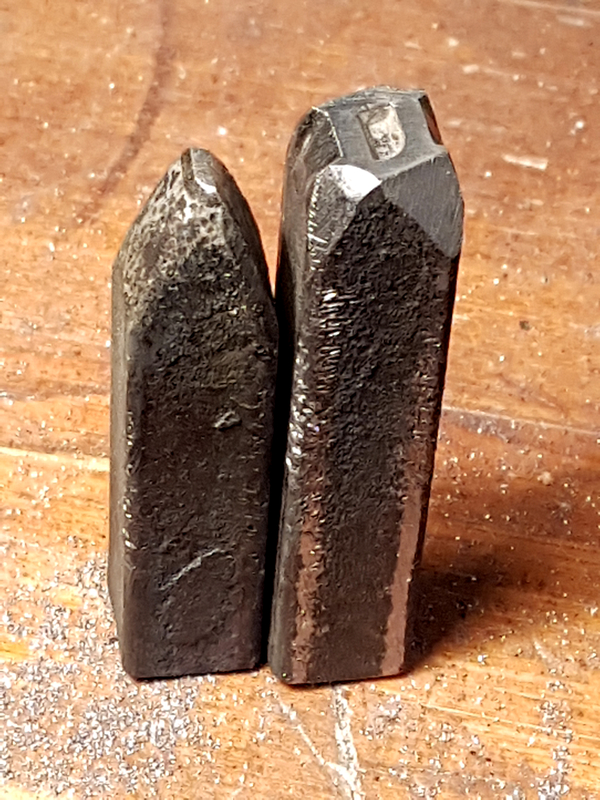 A couple years back I found a salesman sample kit of different kinds of steel, all in sticks that look like they are made for punches. I have files and gravers. Really want to give this a try soon. 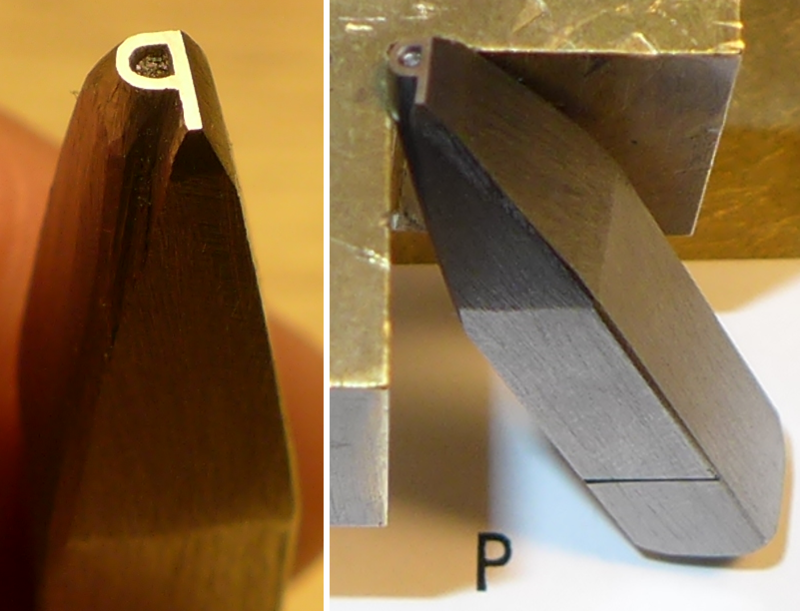 I am cutting replicas of Gutenberg's B42 type punches for training purposes (x-height: 4,2 mm). This is my second attempt to make an e. It's OK but I will cut another one to see if I can't make it better (there are some mistakes in it). I am finding using gravers in the tiny counter terribly difficult. Would love to see how a master punchcutter would do it.